Mumbai has been attacked once again. This time luxury hotels, hospitals, railway stations, and restaurants have been made target. More Americans and British than Indians. Again, lives have been lost. Media, news channels, online news, bloggers, witnesses, and victims are now reporting this nightmare while military and commandos are trying to gauge the event. The firing and bombing apparently started close to the Gateway of India. The gunbattle then moved on towards CST and raged on for over 45 minutes from 10 pm. Gunfire has been reported from Nariman House, Cama Hospital, Metro cinema, Leopold Cafe. BP gas station blown up. Oberoi, Dadar stations evacuated, VT trains stopped. Terrorist gunfire also reportedly came from a Qualis van with police markings. 195 dead (updated) , scores injured. Once again human life has been shaken with fear. Once again freedom has been challenged. Tomorrow it will be forgotten. Venus of the Indian screen Madhubala is honored by Indian Postal Service: on 18 March 2008 a stamp was released in her memory. 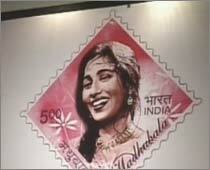 After Nargis, Madhubala is the second Indian actress to have a stamp released in her honor. The Indian Postal Service organized a special two-day event in Mumbai on Indian cinema titled Magic of Film Through Postage Stamps along with a philatelic exhibition titled Mahafilmpex. They also showcased a few landmark movies.